HUGE Fossil Fish Aspiration- Fish Choking on a Fish! 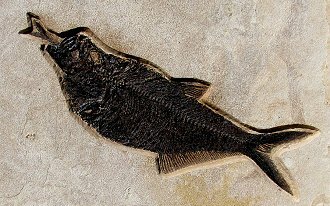 The occurrence of an "aspiration" - one fish in the act of swallowing another - is extremely rare in the fossil record. Here is a very fine example from the famed Green River Formation in Wyoming. Renowned for its high quality fossils, this formation has yielded over 19 species of fish, of which the ancient herring Diplomystus was one of its most distinct. This HUGE example has been caught in the act of swallowing, head first, a smaller Knightia fish. The distinct Knightia still protrudes from the mouth and presumably choked the larger fish to death. And, remember, the Diplomystus is almost 19 inches long - this is not a small Trout eating a tiny minnow! This is an extremely displayable and collectible plate of two different fish fossilized forever in the throes of a death struggle!